What type of dishwasher detergent should you use? Dishwasher detergents refer to water-soluble cleaning products. There are currently three common forms of dishwasher detergents on our supermarket shelves, including tablets, powders and gels. Here are the many differences between them in how they work and a guide to which you should use. 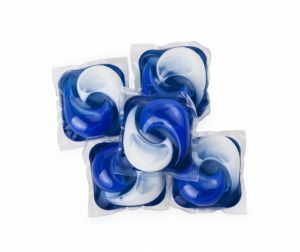 Dishwasher tablets generally come in the form of small bricks of concentrated dishwashing powder, however some may be half or even completely comprised of dishwashing gel, as opposed to powder. They can be placed in the dispenser or simply thrown into the main area of the dishwasher. When it comes to using dishwasher tablets, there is a lot more convenience compared to powders and gels. Dishwasher tablets deliver a precise detergent dosage and are less likely to spill everywhere. In the situation where too much detergent is used, it can generate excess foam inside the dishwasher, which may cause leaks or even reduce the life of your dishwasher. With a precise dosage of tablets, it may save you on repairs in the future. Another benefit of dishwasher tablets is that they often contain not just detergent, but rinse aids and other additives that can drastically improve the quality of the clean done by your dishwasher. The famous red ‘Powerball’ in dishwashing tablets is a rinse aid. 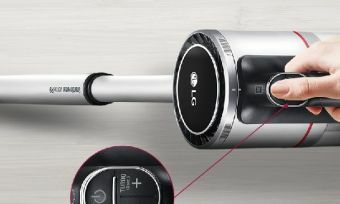 It aims to help remove detergent residue from your dishes for that sparkly clean finish we’re all looking for. Dishwashing tablets can also combine tasks like pre-wash and de-greasing so that you can spend less time soaking and scrubbing. There are even dishwasher tablets that aim to clean your dishwasher. You may also find that there is a variety of fragrance options for dishwasher tablets available. If you’re looking for more than just a clean, but a fresh smell when you open up your dishwasher, you may like to consider the tablets range. Dishwasher tablets tend to be more expensive than other forms of dishwasher detergents. When you have a different dishwasher load each time, you may find that there is less flexibility with tablets compared to powders or gels, as it only comes in one size. 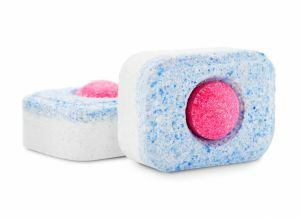 Some dishwasher tablets may tend to also need longer rinsing cycles in order to remove mineral deposits. 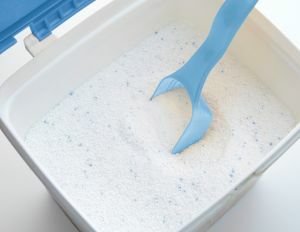 As the name implies, this type of detergent is a powder that is either poured or scooped into the dispenser in your dishwasher. It may be preferred for homes with smaller washing requirements that may not need to use a full dishwasher tablet. Traditional powders are still a viable option for stain removal and easy rinsing. Although it may be abrasive for delicate tableware including glasses, you may like to consider it as an option for pots and pans to remove burnt-on stains. Dishwasher powder is generally the cheapest form of dishwasher detergent and tends to last for a long time before it needs to be replaced. You also have greater flexibility with being able to pour as much or as little as you need for your specific dishwashing load. Dishwasher powder can be messy to pour and if you over-use, which is a very easy mistake to make, your dishes may be left with powdery residue on them – not a good look. On the other hand, if you under use, also a mistake just as easy to do, your dishes won’t be cleaned properly. You may find powder spills easily to other areas of the dishwasher and is a hassle to clean up. If you have inquisitive kids or pets, loose powder in a box could also be a hazard for them to access. Dishwashing gel is similar to the washing up liquid used for handwashing dishes. Like powder, it is poured into the dispenser in your dishwasher. It tends to sit in the middle in terms of price between powder and tablets. Dishwasher gel may be preferred for homes with specific washing requirements. Compared to powder, slow-pouring dishwasher gel gives you more control to measure enough detergent for your specific load or wash cycle. You may find it also a little easier to pour and wipe away if you do spill some when pouring. The water-based composition helps it to be less abrasive on delicate tableware. As mentioned earlier, dishwashing gel does also come in a tablet form. This will be more expensive, but can help provide a consistent measured dose. There isn’t a lot of variety of dishwasher gels available and this may be due to confusion between dishwasher gel and handwashing liquid. Hand washing liquid should not be used in dishwashers. Although gel is more likely to dissolve than dishwashing powder, it is possible for dishwashing gel to not dissolve completely. If this happens, it could leave water spots or a thin film on your dishes. Dishwasher gels may be more expensive than pre-measured dishwasher tablets in the long run due to the inconsistency when pouring. Also be sure to check if your dishwasher is suitable for dishwashing gel – not all types are. What type of dishwasher detergent should I choose? When choosing which dishwasher detergent to use, it’s important to consider the prices of the different detergents, along with which one will work best with your dishwasher. You may be able to find this information online, or in the user manual or guide for your dishwasher. With more and more dishwashing tablets on the market, it could indicate an increasing popularity because of their convenience and efficiency. The price, however, may have others lean towards another option. Powder is certainly the cheapest. You may like to consider buying more than one detergent as it may help if you have a variety of tableware and dishwashing loads. Give yourself an option for any occasion! There are online ratings – such as ours – that you may like to use to help you compare dishwasher detergent brands and see how other Aussies rate the products they use. Sign up to receive our weekly consumer newsletter with the latest ratings and reviews.